WASHINGTON, D.C. (October 6, 2014) — Window World®, America’s largest replacement window and home remodeling company, completed its 70th Veterans Airlift Command (VAC) mission Tuesday, September 30, 2014. Following their participation in this past Saturday’s Capital Region Tough Mudder 2014 in Gerrardstown, WV, Window World flew 7th Special Forces Group MSG Jared “Red” Bullock, Army Ranger PFC Kyle Emmons and MSG Troy Konvicka home to San Antonio, Texas. Window World of West Michigan is locally owned and operated in Kentwood, MI. Window World is an ENERGY STAR® partner and its window products have earned the Good Housekeeping Seal for ten consecutive years. The store, located at 5228 S. Division Ave. in Kentwood, MI, serves homeowners in the counties of Barry, Kent, Muskegon, Allegan, and Ottawa. For more information about Window World of West Michigan, visit windowworldgrandrapids.com or call (616) 988-9996. Window World proudly supports the Veterans Airlift Command in providing air transportation to wounded warriors and their families for medical and other compassionate purposes. The Veterans Airlift Command offers soldiers returning from combat, often with devastating injuries and unable to traverse commercial airports, the opportunity to fly worry-free to visit their families and receive treatment. 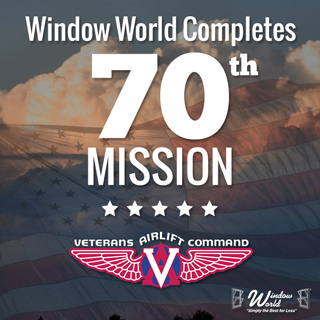 Window World has flown over 75 missions and has surpassed over $1 million dollars in flights and in-kind donations since we began our partnership with the VAC. With a number of veterans in the Window World family, we know how meaningful a simple “thank you” can be. Participating in this special program is our way of conveying our immense gratitude for America’s Veterans.